Opposed to the landmark agreement as a candidate, the president's views are said to be evolving. Donald Trump continued to distance himself from fellow world leaders over climate change at the G-7 summit, and said he’ll determine next week whether to pull the U.S. out of the landmark Paris climate accord. “I will make my final decision on the Paris Accord next week,” the president told his almost 31 million Twitter followers on Saturday. Trump, who for months has delayed a decision on the climate agreement, made his announcement at the conclusion of the Group of Seven summit in the resort town of Taormina, Italy. In an unprecedented step, the U.S. broke from the other six nations in a joint statement issued at the summit’s conclusion, saying America is reviewing its climate policies while the G-7 members others remain committed to the Paris Agreement. Climate was among the most disputed issues separating Trump from other leaders at the two-day meeting on the Sicilian coast. A top White House adviser said the president’s views were evolving on the issue, but Trump wasn’t immediately swayed by arguments from Chancellor Angela Merkel of Germany, France’s President Emmanuel Macron and others to honor the Paris Agreement, brokered in 2015 by almost 200 nations to slash fossil fuel emissions and boost funding to ease impacts of global warming. 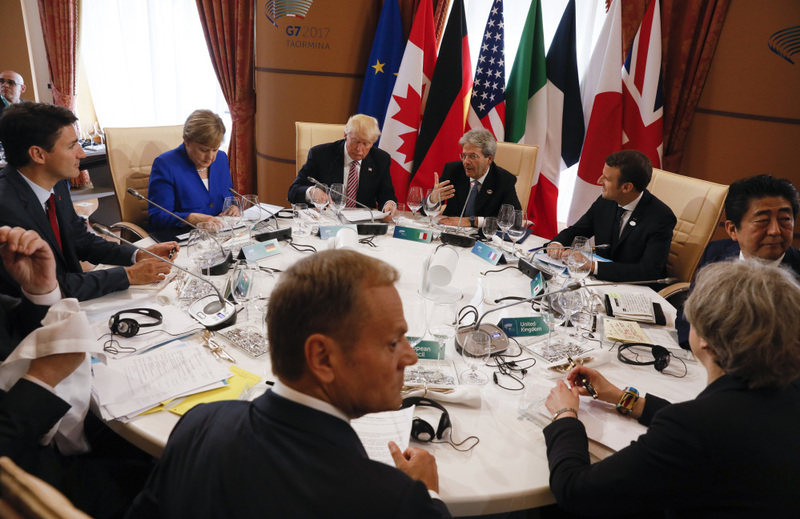 Diplomats spent days trying to hammer out language for the G-7 joint statement. Past communiques, which are painstakingly crafted to reflect common goals and values of all seven nations, have dedicated lengthy sections to climate change. At one point this week, the words “Paris Agreement” were nearly excluded from the statement, underscoring how contentious the issue became in Taormina, said a Canadian government official who spoke on the condition on anonymity to discuss private deliberations. Trump, who once said the concept of global warming “was created by and for the Chinese in order to make U.S. manufacturing non-competitive,” repeatedly vowed to pull out of the Paris deal during his election campaign, but has sidestepped the issue since taking office. Delaying a decision about the accord provided opportunity for G-7 leaders and Pope Francis to press Trump to honor the U.S.’s environmental commitments. Now the president heads back to Washington, where much of his party is pushing him to do the opposite. Last week, 22 Republican senators, including Majority Leader Mitch McConnell, R-Kentucky, sent a letter to Trump urging him to exit the Paris accord. Members of his administration, meanwhile, are deadlocked on the issue. Environmental chief Scott Pruitt and top strategist Steve Bannon are pushing for a pullout. Secretary of State Rex Tillerson, White House adviser Jared Kushner and Ivanka Trump, the president’s son-in-law and daughter respectively, have urged the president to stay in the deal. John Kirton, director of the University of Toronto’s G8 Research Group, said Trump’s trip home may not bode well for those in favor of Paris. “If you let him go back to the civil war within the White House, Pruitt might win,” he said. Trump has criticized efforts to cut emissions, saying they limit U.S. economic competitiveness. The president’s views on the Paris accord, however, are evolving, White House National Economic Council director Gary Cohn told reporters Friday in Italy. Trump may be willing to stay in the agreement, Cohn said, if the U.S. can scale back commitments made by former President Barack Obama. The Paris Agreement is broader than any previous climate accord. It calls for reducing pollution in hopes of limiting global warming to 2 degrees Celsius above temperatures at the outset of the Industrial Revolution. Hundreds of corporations and investors have endorsed the pact, including oil majors Royal Dutch Shell Plc, BP Plc and Exxon Mobil Corp., which was previously led by Tillerson. Alden Meyer, who’s followed climate talks for two decades as director of policy at the Union of Concerned Scientists, said Trump’s reluctance to support it puts him at odds with much of the world.